Native American art history has evolved from cave paintings to intricate weavings, designs, shapes and materials. Kachinas, tribal jewelry, pottery, basketry and even tattoos are mainstream forms of artwork that continue to develop. Artists from Georgia O’Keeffe to Logan Maxwell Hagege have fallen in love and been influenced by the west and Native American art. Native American artist Shonto Begay intertwines modern methods with his Navajo background to create a narrative moment in time. Beginning with simple drawings on in a cave or a sharpening of a weapon, Native American art has always been deeply connected to the spiritual and natural. Although Native American art has evolved over many years, the techniques remain a time-honored tradition. After colonization, Native American jewelry-making traditions remained strong, incorporating, rather than being replaced by, new materials and techniques such as glass beads and more advanced metalworking techniques. Native American jewelry making can be broken into two categories: metalwork and beadwork. Native American arts metalwork was fairly rudimentary before colonization. The metal was hammered or etched using copper, shaping pieces into pendants, earrings, necklaces or beads. In the 1800’s silversmithing was introduced into the Native American jewelry and the Navajo, Hopi and Pueblo Indian artists quickly adopted distinctive patterns and styles. The squash blossom necklace, Hopi silver overlay bracelets and Navajo turquoise inlay rings were some of the unique designs created with combination of the new techniques with traditional designs. Another popular form of Native American art is pottery, which extends back thousands of years. Pottery was never created purely for utilitarian purposes but like most Native American objects was a product of Mother Earth with a spiritual connection. Native American pottery developed into one of the most well-known Native American arts. Early cultures of the Southwest Native American tribes such as the Hohokam and Anasazi all made pottery using techniques that are still common in modern-day pottery. Native American weaving is rich in history and popularity. According to legend, Spider Woman was first to weave her web of the universe and taught Din’eh (Navajo) to create beauty in their own life teaching balance within the mind, body, and soul. After weaving the universe, Spider Woman taught the gift of weaving to the Navajo. 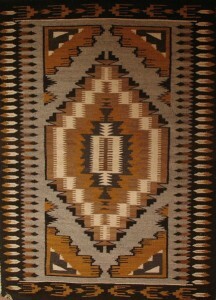 To this day, Navajo rugs are some of the most coveted weavings in the world. Native American tribes continue to develop Native American Arts in distinct aesthetics rooted in spiritual artistic visions and cultural traditions. Modern-day Native American artists are able to maintain traditional Native American arts methods while adding their personal touch to each contemporary piece.